Dean Miller (Hugo Stiglitz), a TV reporter, is getting ready to interview a scientist named Hagenback. While waiting at the airport, an unmarked military transport lands and bacon-faced men in sweaters and nice sports coats begin pouring out of it to stab and shoot anyone they can find. Dean races to reunite with his wife, Anna (Laura Trotter), before the blood drinking maniacs can get to her first. As Dean and Anna look for a way of the city, the infection that plagues the men from the plane begins to spread. Soon the couple find themselves trapped in an amusement park as hordes of killers close in. Before the Dawn of the Dead (2004) brought the question of fast zombies vs. slow zombies to the forefront of fan arguments, Nightmare City was showing off leaping, sprinting, weapon toting zombies. The director, Umberto Lenzi, insists they are not zombies but infected people, once again preempting another seemingly eternal argument, ‘Are they zombies or not?’ brought to light most recently by 28 Days Later (2002). I don’t wish to cast Nightmare City as brilliant progressive cinema, but underneath its cheap and sleazy outer layer there is more thinking going on than you would expect. The plot is the purest nonsense with some half tossed away explanations that blame radiation for the literally bloodthirsty mob that has invaded the city. At its best, 1980’s Italian horror could cruise by on atmospheric visuals alone. 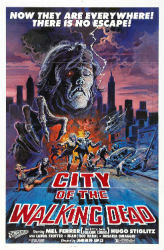 Nightmare City isn’t so quite so lucky; it has a grimy cheap look that only highlights the low budget. Some of the gore is well realized, but things like the infected humans' weird scabby faces never look anything but inexpensive. It’s difficult to judge a performance when dubbing is involved but nearly everyone in Nightmare City plays out the events with enough seriousness to help sell the threadbare plot. Stiglitz in the lead is a capable action hero who is free of the posturing and tough guy acting that normally plagues that type of role. Mel Ferrer is also notable as General Murchison, he sells the non-explanation of the monsters with enough gravitas that you almost forget there’s barely a reason for them to exist at all. What Nightmare City does have working for it, are the unrelenting attacks by its monsters. Rarely shown on a small scale, each attack features dozens of creatures hacking, shooting and blood-drinking their way through crowds. (They also seem to have a propensity for ripping women’s shirts off for some reason.) The sheer number and scale of these battles creates a oppressive dangerous atmosphere, and keeps it going with almost constant action. Even modern zombie films rarely show carnage this large of scope. There are much better zombie films, and much better Italian horror films out there, but there are few films more absurdly entertaining than Nightmare City. Trash in every sense of the word, but wonderful trash and I’m glad it exists. This is one I was actually trying to find back in 2005, but after several wrong discs sent by Netflix, (ah, the era before streaming) I think I just...forgot about it. Thanks for the reminder. I might have to track this down. There is a pretty decent Blu-ray available if you want to see it in glorious 1080p. Actually, I'm pretty sure you're the person who introduced me to this movie. Great googly moogly, this is easily one of my all time favorites. The movie is as dumb as it is crazy, and seriously it doesn't care. And in turn, neither do I, because it's too much fun. Awesome review, for an awesome film.